31 year old female with large left bunion had Bunionplasty® procedure Bunion Surgery with Dr. Blitz. The Contours Lapidus Plating System was used to realign the bones, and she was allowed to walk on the operative foot in a small surgical shoe. 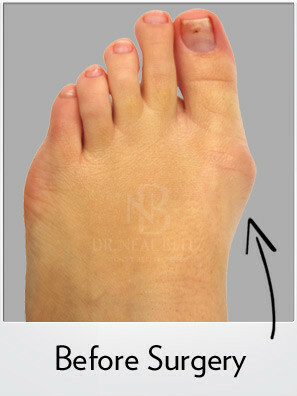 Before and immediately after bunion surgery pictures demonstrate good alignment of the big toe without the bunion.